Note to Reader: To best understand the lesson contained in this Coaches Corner, it is highly recommend to first read Cause and Effect. In December, 2001, while serving as a Deputy Sheriff with the Santa Cruz County Sheriff’s Office, I received a bulletin about a defensive tactics seminar on Krav Maga. The thought of learning the Israeli Military system of battlefield hand-to-hand fighting was intriguing, and I decided to enroll in the course. The chief instructor of the 5 day course was Londale Theus. Londale was a former NBA basketball player who had decided to pursue his lifelong dream of being a Police Officer. Londale served with the Santa Monica Police Department on their SWAT Team and had received his Instructor Certificate in Krav Maga from Darren Levine, the highest ranking Krav Maga instructor in the United States, and the third highest ranking Krav Maga instructor in the world. During the course, and the years that followed, Londale became a mentor to me, and taught me many of the principles of warriorship I now teach today. One of the greatest lessons Londale taught me was the difference between our experience of pain. During our lifetime, we will be faced with numerous opportunities to decide the manner in which we will experience pain. As Warriors of Light, our intention is to experience pain only once from each decision or life experience. To suffer and experience pain more than necessary is a waste of our life energy and willpower, and increases the likelihood of spawning further karmic events which lead to further pain and suffering – a vicious cycle. There is a hierarchy in which pain manifests itself in our life. To lack awareness of Universal Law and break the Law leads to pain. You experience the pain of Karma, yet you are ignorant to the cause of the suffering. Your suffering attracts repeated life-events that lead to continued violation of the Law. 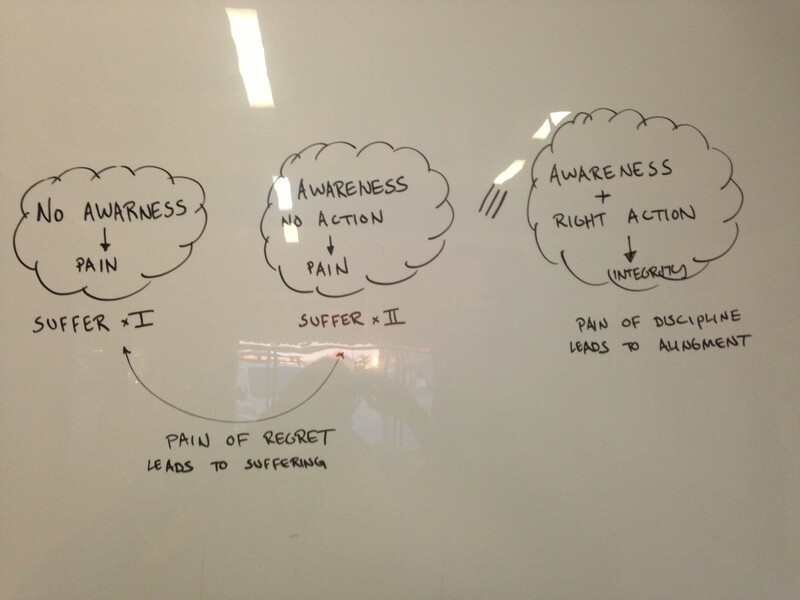 The cycle continues at an unconscious level and leads to further pain and suffering. To have awareness of Universal Law and willfully break the Law leads to pain twice. You experience the pain of Karma, and you experience the pain of a willful violation of personal-integrity. You suffer and are aware of your responsibility. You experience the pain of regret, and the pain of your Karmic experience. To have awareness of Universal Law and abide by the Law may also lead to pain. This is the pain of discipline. 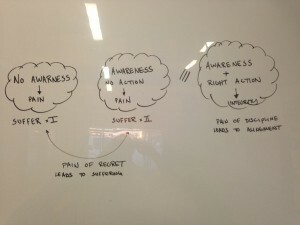 This pain is experienced only once as the pain of effecting willpower in decision making. This is the same felt-experience of pain in physical exertion. This pain ultimately leads to strength through the proper alignment of values and action. Our quest as Warriors is to increase our awareness of Universal Law. Once we know the Law, our intention is to align our values and actions. As Warriors of Light, we must learn to love, embrace and be comfortable with the pain of discipline.